She comes with her own control scheme. For ease of use it is recommended you rebind your lift-up to shift and your lift-down to ctrl. Press nothing and the stabilizing computer will make you gently fall. Press x to deploy turrets and door. Door automatically opens when approaching the ground. Turrets automatically aim and fire at enemies. Charge for best turret performance. The Racionne (pronounced Rash-ee-own-ay) was the precursor to the Leoneis, another quad-turbine HWAT (heavy weight aerial transport) that was reviewed in the comcore. Once the leoneis came out I kinda retired the Racionne since the leoneis was half the cost and could carry things of any size and MUCH much bigger weight. I recently got around to reviving her and turning her into a multi-purpose combat support vehicle. She has a bay for carrying a small vehicle, and a door for keeping the vehicle inside the bay. The door automatically opens when you come close to the ground and falls shut when you take off. The Racionne has become more of a multi-purpose military support craft as opposed to a true transport VTOL, although it still serves that purpose. She now has two fearsome AI missile turrets mounted under each wing that surprisingly work. More turrets are planned, as shown by the random shotgun in the middle of her back. Eventually I plan to get rid of the cargo bay and give the Racionne a hook for snagging techs like the Leoneis has, but for right now she has a cute little space for storing techs. 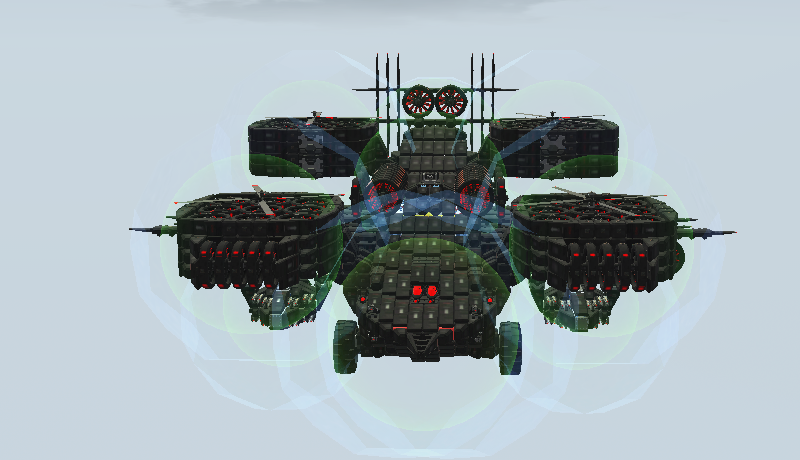 Mjolnir: A hoverbugged airship which takes full advantage of the fact all hoverplates are now vectorable. Drop the hammer! Just don't get hit... For use: Charge before use, WASD + Q/E, Page Up/Page Down for altitude changes, sinks very slowly by default and when under normal power but goes up slightly when boosting. 2) When using the gun, change the controls to "Artillery_Gun". 3) W & S elevates & depresses the gun, while A & D rotates the gun left & right respectively. 4) For the vehicle, change the controls to "Car"
Argentavis: Spawn enemies around the turret. Spaceshipppppppsddsd: Shift. Press x after you have reached desired height(17000 feet). "A limit of no more than ONE snapshot or 4 Techs in a GAME SAVE per player, please If submitting a GAME SAVE please specify if it's R&D or Creative in your submission." do people not read this? if you want to submit more then then tech it has to be in a save game NotExactlyHero. Here comes one of my modest build, Robust. Instruction(s): Charge up before greeting your enemies with some spicy laser beams. W/A/S/D - general movements. Q/E- strafe. My Attacker Lance. I made it for the "Lance" creator. Charge up the craft before using it. There are also boosters on it so don't forget to use them (It's a looooooong boost that you can use approximately 1min). The second craft is my "Pulsar". Charge up the craft before using it. 13 minigun lasers that tear trough the enemie's shields and blocks. Don't forget to use booooosters. It's just "easier" to have it in a game save. The Supremacy Freighter: A heavy space freighter that can carry huge numbers of resources, and is built to guarantee their arrival. Comes equipped with long-range cannons, missiles, and auto-cannons, as well as large energy stores and solar panels for those longer resource runs. Sinks extremely slowly when not moving. I've been making a lot of form-over-function builds lately and downloading others' stuff to play on the go (offline) on my laptop, which has lead to me not really making that many campaign focused builds lately. However, I have a few things that might actually be okay to show off, the regular Albatross build and the ol' reliable, Destroyer I.
Edit: The Albatross was a complete ignorance of Controls so it should pilot like a regular plane. The Destroyer was before complicated controls so it handles like a car, there are boosters internally as well.